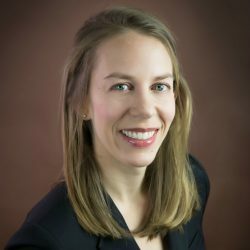 ​Julie Leis has more than 15 years of experience in applied research and program evaluation in the areas of home visiting, mental health, and child development. She brings to JBA technical expertise in program evaluation, research design and measurement, data collection and analysis, and continuous quality improvement. She is skilled in providing technical assistance on evaluation, performance measurement, and continuous quality improvement. Leis currently leads the Literature Review and Program Scan on the Arts and Pain Management and Substance Use Disorder project and serves as deputy project director for the Healthy Steps Outcome Pilot Project. She is a technical assistance liaison for two projects: Design Options for Home Visiting Evaluation and Support for Maternal, Infant, and Early Childhood Home Visiting Program Awardees to Build Capacity for Performance Measurement and Continuous Quality Improvement. Previously, Leis was a Society for Research in Child Development Fellow at the Office of Planning, Research and Evaluation in the Administration for Children and Families. As a fellow, she provided leadership and oversight on projects related to healthy marriage and responsible fatherhood, home visiting, Head Start, and Early Head Start. Leis received a Ph.D. in public health with a concentration in mental health from the Johns Hopkins Bloomberg School of Public Health.